No Fenders -Formula 1, IndyCar and A Whole lot more..: The 'Rooskie's Are Coming, The 'Rooskie's Are Coming - Honest! The 'Rooskie's Are Coming, The 'Rooskie's Are Coming - Honest! And like A-L-L good stories produced here at Nofendersville, once again this lookie-see' for aspiring Mother Russia racers has morphed into two-part harmony; Hooah! As Y'all are saying, but what about the Russian Big Boyz, right? In 2013, RT Russian Time was finally admitted entrance into GP2, effectively replacing I-Sport International who'd run into financial difficulty. As Russian Time made a brilliant debut by capturing the team's title along with Sam Bird finishing runner-up to series champion Fabio Leimer, who's currently contesting the World Endurance Championship for Rebellion Racing, a la Bird who's also embarked upon an endurance racing career. 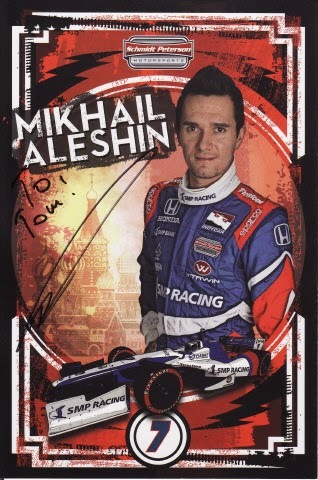 Although Mikhail Aleshin is indeed the first Rooskie' IndyCar pilot, having just completed his rookie campaign for Schmidt Peterson Motorsports, the 27yr old Muscovite' wasn't the first Russian driver to ply his trade Stateside, as previously unknown driver Sergey Mokshantsev briefly contested the Indy Lights championship 'Wayback in 2009 for the long forgotten Brian Stewart Racing team, having fallen off the radar screen since then. Aleshin's biggest claim-to-fame most notably is capturing the 2010 Formula Renault 3.5 series championship, yet the Moscow native, like all aspiring racers has a wealth of single seater experience, having raced in GP2 Asia and GP2, the long forgotten A1 GP series along with the requisite Feeder Series, which saw him win the 2004 FR 2.0 Italy Winter series title along with finishing third overall in the '09 FIA F2 championship. Ironically, in 2011 as Mikhail was fighting the inevitable cash woes afflicting many drivers worldwide, forcing him to abandon his Carlin GP2 ride, he landed a part-time seat back in Formula Renault 3.5 which came at the expense of Anton Nebylitskiy, who he replaced. After a ghastly winter's GP2 Asia campaign, upon having won the Formula Renault 3.5 title with Carlin, Mikhail only raced sporadically alongside Max Chilton, who's gone on to become a Marussia F1 racing driver! As Aleshin tested for Renault in the 2010 Abu Dhabi Young Drivers test - believing he'd advance to the pinnacle 'O motorsports the following year, which saw countryman Vitaly Petrov retaining his seat instead as the only Rooskie on the F1 grid. thus, having apparently grown overly frustrated with Formula 1's doors being closed, Mikhail headed Stateside instead for this year's Indy Car Series season, where he became the sport's first ever Russian to podium - taking a fine second place at Houston behind then team leader Simon Pagenaud. Yet I was totally unawares' that Fomenko had once been a burgeoning Sports Car driver, having contested the Rolex 24 and Le Mans twice, interestingly teaming at Circuit de la Sarthe with another unknown driver, Frenchman Patrick Bourdais; Hmm? Who I've just learned is the father of le Hamburgular, or SeaBass, nee Sebastain Bourdais. Although Vitaly Petrov was indeed the first Russian to contest the modern day FIA World Championship, nonetheless, Prince Igor Nikolayevich Troubetzkoy was the first Russian to drive a Ferrari in Grand Prix motor racing, piloting a Tipo 166 in the 1948 Monaco Grand Prix, having won the prestigious Targa Florio the same year also for la Scuderia in a Ferrari model 166 Spyder. Also beating both Petrov and Daniil Kvyat to the confines of a modern day F1 chassis was Sergey Zlobin, who was a test driver for Minardi in 2002, although never actually taking part in a Grand Prix. As Zlobin has an interesting back-plot to his racing career, having been the victim of a car bombing 'Wayback in '07, which he survived! And as Y'all know, this year's Formula 1 season saw the addition of then teenager Daniil Kvyat at Scuderia Toro Rosso who broke somebody named Vettel's record for youngest ever driver to score points in an F1 race, which is exactly what he did with his fine ninth-place finish Down Under in Albert Park; ironically being elevated from tenth after his soon-to-be Red Bull team-mates exclusion. 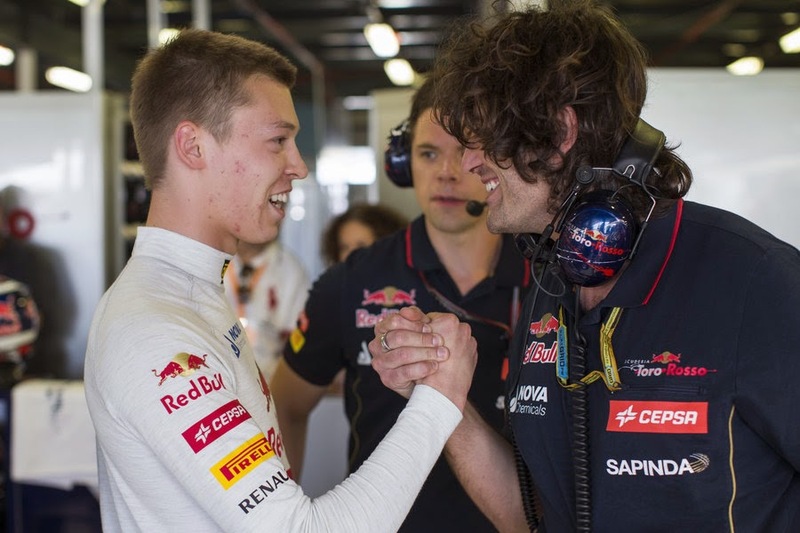 Since Y'all know that Kvyat's just been promoted to be Daniel Ricciardo's team-mate at Red Bull Racing next year in the wake of Sebastian Vettel scurrying off to la Scuderia! Which as Grizzled Journo' Joe Saward said, was fortuitous - with the Russian GP then being a week away, not to mention the 22% growth rate Russia's experiencing market-wise, apparently, as DAMN! That's a whole lotta Red Bulls, so drink up Boyz; Hooah!